The Brief: A meme with images from the film Despicable Me illustrates the experience of realizing that there's a major flaw in your plan. In the 2010 film Despicable Me, the character Gru – an aspiring supervillain voiced by Steve Carrell –presents his plan to steal the moon. To his surprise, one of the illustrations for his presentation has been swapped out by a child with a drawing of him on the toilet. When he realizes this, Gru’s enthusiasm for his plan quickly changes to confusion and embarrassment. This scene has been turned into a four-panel meme. It shows someone passionately presenting a plan until they realize that it has a major flaw. 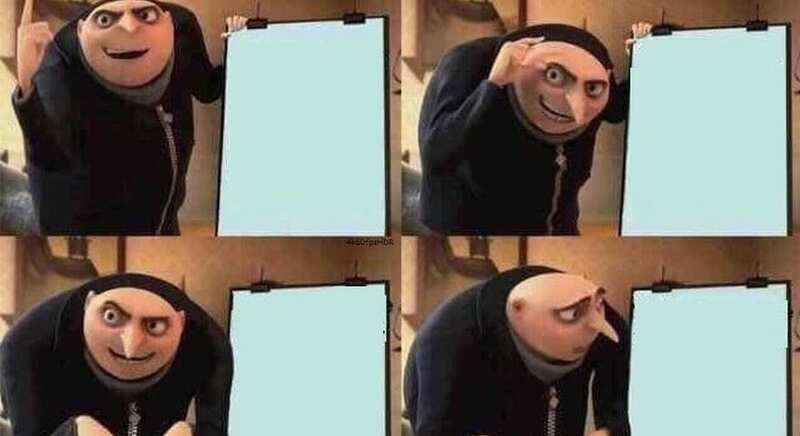 Versions of the meme swap out Gru’s drawing with text, and sometimes Photoshop someone else’s face onto Gru’s. The format is often used to show historical figures becoming aware of their upcoming downfall or demise.